Posted on June 30th, 2018 in At large. At daybreak it was a touch under 10C at RealSurf HQ and wind was out of the NW at 5-7 kts. The MHL buoy was detecting only 0.9 m of 9-sec SSE bump.Skies were mostly clear. I did my usual pre-radio report run this morning and can report that it was just about – but not quite – flat. There were three or four people in the water at Northy where there were knee to maybe waist high bumps sliding in through a glassy sea. From there south to Collaroy and the north side of Long Reef it was essentially flat. Around at Dee Why there were a couple of high tide peaks briefly flickering to life with again knee to waist high bumps. But it was really a case of one or two turns and you’re done. At report time the tide was running into the 1.34 m high at 0940. It’ll ebb out to a 0.6 m low at 1510. Looking at the swell models this morning, it would seem Sydney’s facing a week of very small to flat conditions. The very long range projections are currently showing a potential strong south pulse from around next Monday. But they’re also predicting heaps of S-SSW wind with it. That’ll all be academic for me as by then I’ll be on the other side of the world, from which I hope to send you the periodic postcard (wi-fi gods permitting). A high pressure system near New Zealand is slowly moving east as a low pressure trough moves over the Tasman Sea. Winds over New South Wales waters will tend west to northwesterly ahead of a front crossing the region late today and early Sunday, before turning west to southwesterly behind it, as another ridge extends across the state. Northwesterly 10 to 15 knots, reaching up to 20 knots offshore during the day. Winds turning westerly in the late afternoon. Below 1 metre, increasing to 1 to 1.5 metres offshore. West to southwesterly 15 to 20 knots turning south to southeasterly below 10 knots during the day. Southwesterly below 0.5 metres, tending southerly 1 to 1.5 metres during the morning. Southeasterly 10 to 15 knots turning easterly during the afternoon. Posted on June 29th, 2018 in Dee Why. Chilly offshore under mostly clear skies as Friday kicked off. Down at the beach, conditions are distinctly smaller again this morning. There were waist high peelers at Kiddies, but it was just too small for the point to break (at least while I watched). At 0600 the MHL buoy was showing 1.3 metres of 10-second SSE (160°) swell, so the waist high stuff along the beach was in line with those numbers. I wouldn’t be surprised if it was a touch bigger up toward the Longy end. Tide hits a 1.35 m high at 0900 and ebbs to the low at 1430. Here’s hoping on your behalf! Have a top old Friday everyone and keep on smilin’! A high pressure system over the southern Tasman Sea is slowly moving east as a low pressure trough clears New South Wales and moves over the western Tasman Sea. Winds along New South Wales waters will tend west to northwesterly behind the trough, before turning west to southwesterly during the weekend as a cold front clips the far south, and another ridge extends across the state. Westerly 10 to 15 knots turning northwesterly in the early afternoon and increasing to 15 to 20 knots in the evening. Northwesterly 15 to 20 knots turning west to southwesterly in the evening. Southwesterly 15 to 20 knots becoming variable about 10 knots during the morning. Southwesterly around 1 metre, tending southerly 1 to 1.5 metres during the morning. Posted on June 28th, 2018 in Goat's Forecast. Small today, but little rideable waves at places for mals. In an effort to give you the most full-some-est outlook he can, TG has stretched his muscles. strained his eyesight and generally got himself all wound up looking at the week ahead. But the outlook is pretty much the same whether it’s 1, 5 or 9 days ahead… pretty small. Now that that might be good news to some people, especially as the weather is supposed to be a little better at times than it’s been . A cruisey little mal wave can be a lot of fun, if the banks are right for those who have to watch their ticker doesn’t overdo it…and for those who don’t want to have to fall too far down off the wave. Saturday: 1 metre or less South East. Get out and have some fun…maybe wait till it stops raining… or wait till tomorrow. The BoM says the temp at 4 pm Thursday is currently about 11 but feels like 4. Water temp is around 19. Sunny. Areas of morning fog in the outer west. Light winds. Sunny. Areas of morning fog in the outer west. Areas of morning frost in the west. Light winds. Posted on June 28th, 2018 in Dee Why. Swell has dropped overnight and this morning at first light Dee Why was seeing very occasional sets into the chest range, but mostly it was smaller than that. The MHL data from 0500 showed 1.5 metres of 11-12 sec energy from the SSE (155°), but looking at it, I reckon it’s probably a bit smaller now. Tide will reach a 1.35 m high at 0820 and will be back to a 0.6 m low at 1355. Wind was light from the WNW at report time. 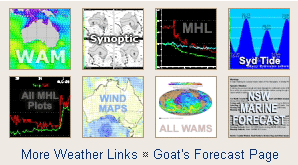 As always, I’m looking forward to seeing the Goat’s forecast later today. From what I’m seeing, there’s not much of interest on the charts over the near term. It’s academic where I’m personally concerned because from Sunday I’m into postcard mode again for the month of July. I’ll try to bob up with the odd over-the-horizon thoughts as wi-fi and schedule permit. And of course there’ll be pictures of this and that too. Needless to say, The Goat will be posting his predictions and possibly a few other morsels along the way. A high pressure system over the southwestern Tasman Sea, is directing east to northeasterly winds along the New South Wales coast. From late today, winds will turn west to northwesterly as a trough moves over the western Tasman Sea and the high towards New Zealand. Behind this winds will tend west to southwesterly as another ridge extends across the state during the weekend. North to northeasterly 15 to 20 knots turning northwesterly 10 to 15 knots in the early afternoon. Cloudy. Near 100% chance of rain. The chance of a thunderstorm. Northwesterly 15 to 20 knots turning westerly during the day. Posted on June 27th, 2018 in Dee Why. Have to say that I didn’t expect it to look as promising as it did when I climbed aloft for the first observation of the day a little before 0800. The point and the beach were both seeing sets into the overhead range. It looked clean and consistent under the showery skies. To put some numbers on it, at 0600 the MHL buoy was showing 1.8 metres of 12-second SSE (152°). Tide was right on the 0742 1.35 m high and is now dropping back to a 0.6 m low at 1320. Wind was around 10 kts from the west. Beachwatch says water is clean everywhere and the ocean temperature is still on 19C (about 2 degrees warmer than today’s predicted high). Wind is expected to come around to the NE as the day goes along, so if the point is of interest, it’s a case of the earlier the better. Outlook is for the swell to fade gradually over the next 48 hours and by this weekend it could be very small to flat most places. Have a top old Wednesday everyone and stay happy! A high pressure system over the southwestern Tasman Sea, is directing east to northeasterly winds along the New South Wales coast. From late tomorrow, winds will turn west to northwesterly as a trough moves over the western Tasman Sea and the high towards New Zealand. Behind this, on Saturday winds will tend south to southwesterly as another ridge extends across the state. Northeasterly about 10 knots increasing to 10 to 15 knots in the late afternoon. Partly cloudy. 90% chance of showers. Northeasterly 15 to 20 knots turning northwesterly 10 to 15 knots in the evening. 1 to 1.5 metres, decreasing to 1 metre later in the evening. Cloudy. 80% chance of showers. The chance of a thunderstorm offshore at night. West to northwesterly 15 to 20 knots. Posted on June 25th, 2018 in Dee Why. A hardy crew amongst them at the point and along the beach by 0730 this morning. Sunny skies and a chilly 8-9 kt WNW wind were creating an attractive setting for the 2 metre 9-10 sec SSE (165°) swell. It looked a bit inconsistent and the average wave face on sets was around the waist to chest high range at the point, but from where people were sitting, there must be a few bigger ones. The beach seemed to be about the same size as the point, maybe a touch bigger as you head north, but as we head toward low tide at noon I’d expect the shutdown to makeable ratio will go the wrong way. The forecast calls for the swell to fade across the day and tomorrow should be a little smaller – but hopefully not flat. The dropping trend could see us back to flat or near enough by the end of the week. Speaking of next week, I’ll be back in postcard mode for July as I travel through some non-surf corners of the world. As usual I’ll try to take advantage of the time zones to post early summaries of the prospects for Sydney, but it’ll be sporadic I’m guessing. A south to southwesterly flow over the waters will tend southeast to northeasterly during Tuesday as a high pressure system moves over the southwestern Tasman Sea extending a ridge to the northwest. South to southwesterly 10 to 15 knots tending south to southeasterly below 10 knots in the afternoon. South to southeasterly about 10 knots becoming easterly in the late evening. Posted on June 24th, 2018 in At large. Lots of folks in the water from Cooks to Mona Vale but no one at warriewood and single punter at little Narra. Size about knee to waist. 25 or so chasing slightly bigger ones at Northy. Posted on June 24th, 2018 in Dee Why. As expected, the swell continued its slow fade overnight and this morning sees only about a metre of 9-10 sec period SSE (152°) waves. At 0745 the wind was coming from the west at 9 to 12 kts and skies were mostly clear. There were a few people in the water along the beach at Dee Why but there just isn’t enough in the swell to get the point going. Size looked to be in the waist to occasionally chest range. Waves were breaking pretty close to the beach on the dropping tide. From what I’ve seen over the last few days, lower tides are mostly seeing shutdown conditions, but as we get back to high tide some interesting peaks in close to shore start to work. Tide’s low at 1120 today and will be back to a 1.7 m high just after dark at 1755. Yesterday evening Eden buoy went hard south and began to see swell in the 1.8 metre range but only about 9 seconds apart. The Bureau tells us to expect the wind to swing south and be 15-20 kts later, so I expect that swell to get here at around the same time. Tomorrow should see more swell from the south with decaying southerly wind. Could be interesting…. surf of one sort or another seems likely through to midweek but after that… not so red hot looking on the models right now. South to southeasterly about 10 knots becoming east to northeasterly during the afternoon. Southerly 1.5 to 2 metres, decreasing to 1.5 metres during the afternoon or evening. Posted on June 23rd, 2018 in At large. Looks fun out there. Waves in the shoulder plus range on the biggest sets, but mostly chest to a little less. Lotsa folks in the water at Northy, hardly anyone among the shutdowns south of there, then around the corner at Longy there were heaps of people chasing shutty-downy but head high sets. A bit smaller as you get to Kiddies and the point, but definitely a few to be had there. To fill in the other details, at 0500 the MHL buoy was seeing 1.4 m from the SE (135°) at 11-12 seconds. Tide was dropping to the 0.5m low at 1035. It’ll be back to a 1.6 m high at 1710. Outlook is for tomorrow and Monday morning to be southerly. Swell should be marginal tomorrow, but pushing back up Monday and if the Bureau has it right, the southerly should back off late in the day. By Tuesday the swell should be settling back again, but the wind is set to be offshore, so there could be some fun ones on tap. Plus the weather should be sunny again. A high pressure ridge over New South Wales will remain through to next week with mostly light to moderate southeast to southwesterly winds along the coast. On Saturday a front will pass through the south bringing fresh to strong southwesterly winds to the far south. North to northwesterly about 10 knots tending westerly 10 to 15 knots in the morning then turning south to southwesterly in the evening. Southerly below 1 metre, increasing to 2 to 3 metres during the morning. Partly cloudy. 50% chance of showers in the morning. Southerly 10 to 15 knots becoming variable below 10 knots during the afternoon. Southerly 2 to 3 metres, decreasing to 2 metres during the evening. Posted on June 22nd, 2018 in Dee Why. Sunny skies at last and as foretold, we still have swell this morning. The point looks to be in the head plus range on sets and it’s a similar size up the beach. Surface conditions were clean and wind was lightly offshore. The MHL buoy was detecting 1.7 metres of 9.5 sec SSE (162°) as of 0600. The good news is that it should stick around at about that intensity all day. Tide is on the way to a 0.5 low at 0950. It’ll be back to a 1.6m high at 1615. Have a great Friday one and get out there if you can! A high pressure ridge over New South Wales will remain near stationary for the coming days, directing light to moderate southeast to southwesterly winds along the coast. On Saturday a front will slip to the south, freshening southwesterly winds along the southern half of the coast later on Saturday and Sunday. West to southwesterly about 10 knots becoming north to northwesterly in the afternoon. North to northwesterly 10 to 15 knots shifting southwesterly 15 to 20 knots in the afternoon. Southwesterly 10 to 15 knots turning southerly during the morning. Around 1 metre, increasing to 1 to 1.5 metres inshore. Southerly around 1 metre, increasing to 1.5 to 2.5 metres during the afternoon.